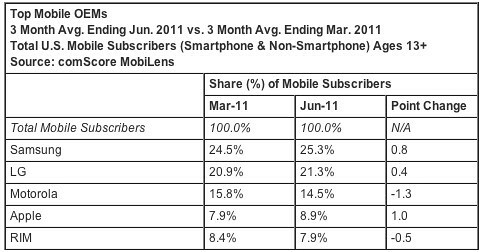 While Google passed the 40% smartphone share (Microsoft must be happy!) in the US threshold, Apple continues to outpace the industry as a whole posting modest 1 point gains in the US smartphone category according to comScore. 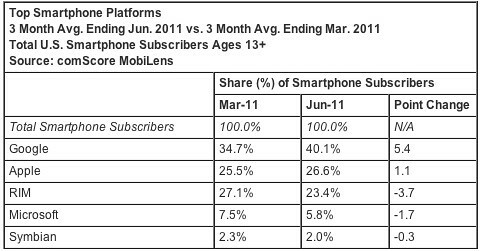 Apple moved up from 25.5% in March to 26.6% in June on the year old iPhone 4 model which also saw its US debut on Verizon. Apple outpaces Samsung and LG for the quarter at the expense of Motorola and RIM. No shocker there.